One encompassing trend in the fitted styles portrayed in this period’s art is the fashionable layering of dresses, specifically two: a base-layer dress and an overdress. The construction of clothing, whether made for nobility or by the common man, was a labor-intensive task, and people generally had less items in their wardrobes than the current-day person. This likely led to the coordinating of fashion layers with as much versatility as possible. Another possible factor for the careful combining of fashion layers may have been the cold weather which was not nearly so avoidable indoors as it is today. 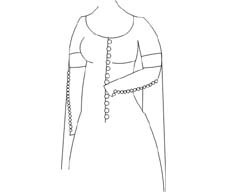 After years of surveying the figural art of the late 14th and early 15th centuries in Europe, I have come to the conclusion that women wore a basic dress for daily living that in some cases also doubled as a solo fashion layer or could be worn with another fancier layer atop it. This dress typically had long, relatively fitted sleeves. I am calling this dress the “versatile” layer as a descriptive catch-all, given how many possible terms for this garment exist in the written texts from the period — none being completely definitive or all-encompassing. The versatile dress could be tailored a number of different ways. For busts needing support, it appeared to require tight fitting through the upper torso. I am certain that this dress existed in a pullover form as well, given how often it is portrayed without any visible signs of closure in the period art and the fact that some body types can achieve bust support with a closely tailored pullover dress. Side-lacing should not be ignored either; it was well in use by the mid-14th century, and provided another way to achieve a snug fit through the torso without showing lacing in front. In my initial forays into this subject, I wondered if the chemise (the “underwear” layer) may have provided bust support in addition to this first fashion layer. While corresponding with Robin Netherton, however, I was convinced to take a closer look at the art of the time for more answers. I found that in pictures where chemises are visible, as in nursing scenes, the fabric of the chemise is often stretched under the breast as a solid panel. 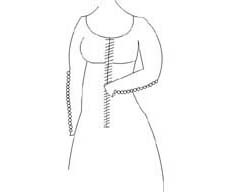 It does seem possible that the neckline might have had a slit in it on occasion, but this hinted against the possibility that chemises were routinely laced-up, at least in the front. It seemed that if there was bust support at all, it probably came from the first fashion layer on top of the chemise. Worth noting, however, is fascinating new evidence for bust support found in the underwear fragments uncovered as part of the Tyrol finds. At least one of the structured garments was side laced, leaving room for extensive reinterpretation of chemise construction and medieval bust support. What specifically makes a dress versatile is the combination of closure and sleeve style elements that allows for the layering of another fancier overdress. Though there are examples in the art of this period where buttons are used down the center-front opening of dresses with long, close-fitting sleeves, these styles are limiting and do not fall within the parameters of versatility. Why? Because buttons on the torso poke into the body when a close-fitting overdress is worn atop it. Also, unsightly bumps or a ridge appear through the fabric of the form-fitting overdress, and that is something I have yet to see evidence for in my ongoing perusal of this period’s art. There are examples of a buttoned dress worn beneath a loose overgown, but I have not come across definitive evidence for such where the fancier overdress was form-fitting. If a dress is a pull-over or has lacing somewhere on the torso (center-front or side), it lends itself naturally to the layering of another dress over it. In addition to torso closure treatments, consider sleeve styles and how they affect the layering of dresses. The button-front dress with long, fitted sleeves is limited as a solo fashion layer because not only is it not able to attractively or comfortably accommodate another fitted dress over it, another dress cannot be worn under it due to its long, tight sleeves. Close-fitting long sleeves go well on dresses designed to be worn alone and with fancier overdresses. They can easily be pushed through loose or voluminous sleeves. Popular styles seen in the art of the period include bag sleeves, “angel” sleeves, or loose tube sleeves. Another popular overdress sleeve style is the short sleeve, with or without decorative flaps or tippets — bands encasing the ends of short sleeves with a decorate flap hanging off the end. Dresses with these sleeve treatments are limited to their roles as fancy overdresses, since their sleeve styles make it unlikely that another fashion layer could be worn over them. Note that the sleeve treatment of the overdress is universally designed to show off some portion of the versatile layer’s sleeves. The complimentary nature of the versatile dress and the fancier overdress is rather consistent in the period art. More questionable than the term used to name it is the likelihood of its popularity in the time period it purports to represent. When held up to versatility standards it fails, as it is restricted as the sole fashion layer worn over a chemise. The buttons down the center front preclude another dress layer over it, and the long, tight sleeves mean that it can’t be a fancy fitted overdress either. Perhaps the lack of fashion layering options is why this style is rather uncommon in the period art and by extrapolation, possibly less commonly worn in period. 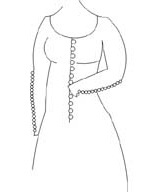 That said, there are some instances of center-front buttoned dresses with long, close-fitting sleeves without buttons (in the Bible of Wenceslas IV, for instance, which can be seen in Olga Sronkova’s Gothic Fashions in Women’s Dress). This close cousin of a style would be equally ungainly as a versatile layer. There is also an English funeral brass that clearly portrays the so-called “cotehardie” style — buttons on long, tight sleeves and up the center-front (Eleynore Corp, c. 1361 or 1391, depending on the source). So how could this style have become so popular in current historical costuming circles? It is attractive, no doubt, and we are often susceptible to seeing pretty dresses worn by others and picking up that idea and perpetuating it. As modern-day people, we also do not tend to think in terms of wearing two dresses, one on top of the other. It may never occur to us that stylistic elements such as buttons or sleeve treatment could limit us in a period fashion environment. Finally, there is the issue of equating masculine fashions of the period with female fashions. Men often did wear short doublets with buttons down the front and up the sleeves. Simply extending that look to the floor would certainly produce an attractive feminine style, but not one that is gleaned from a period source if that is one’s reasoning. Back-documenting this dress is more challenging than one would suspect, given how popular they are to re-create.